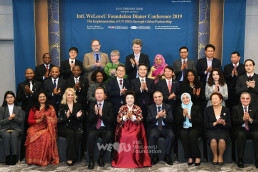 It’s been twenty years since the WeLoveU’s Chairwoman, Zahng Gil-jah, began her journey to benefit marginalized populations, refugees of climate change and war, children with incurable diseases and more through walkathons. And now, her seed has taken root and blossomed in the East Coast Region of the United States. At 10 a.m., the opening ceremony began with a beautiful rendition of the National Anthem accompanied by the U.S. Navy Color Guard. Next, a cultural dance followed and the President of the Intl. WeLoveU Foundation East Coast Region, Daniel Lee, gave his opening remarks. Mr. Lee began by reminding the participants of the purpose behind their gathering. It’s to make a bright Haiti and for the well-being of humanity, but moreover, he emphasized the unique driving force behind the WeLoveU’s activities which is a mother’s love. With this love, the WeLoveU is able to see, hear and also take care of the difficulties experienced by many in the global village. “The love of a mother is the core to each and every activity, initiative and event carried out by the Intl. WeLoveU Foundation. In this world where individualism is increasing, people in tough times are often left behind in despair. For those with such difficulties, the best solution is a mother’s love. It is only a mother’s love that has the capacity to care for and consider all people of the world,” he said. 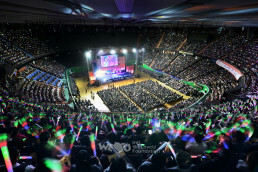 Following Mr. Lee, another WeLoveU speaker introduced the WeLoveU’s works around the world to the audience. From installing water pumps, assisting entire communities in the aftermath of disasters to building schools and more, it’s clear the WeLoveU is busy working all-yearlong—just as a mother gives herself no rest until all her children are cared for. Afterward, another representative stepped forward explaining how the WeLoveU’s activities and initiatives align with the United Nation’s 17 Sustainable Development Goals. In 2015, the UN General Assembly adopted the 2030 Agenda for Sustainable Development including 17 goals to fulfill their universal vision of ending poverty, protecting the planet and ensuring prosperity for all. In a nutshell, the UN SDGs intend to transform the world. 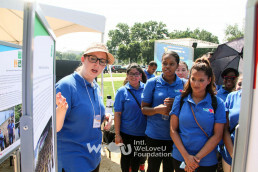 Along the walkway were panels highlighting the WeLoveU’s activities that contribute to the fulfillment of these goals. For example, installing water pumps goes hand-in-hand to accomplish the sixth goal of clean water and sanitation. Delivering solar-powered lanterns to vocational students in Haiti helps fulfill quality education and affordable and clean energy. 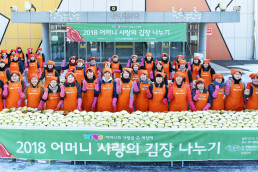 After reading the panels, members pledged their support to fulfill the goals through the WeLoveU’s volunteer service projects. After signing a pledge, they placed a sticker on the world map. It’s because the WeLoveU’s initiatives not only impact one region but extend a helping hand to the whole world. 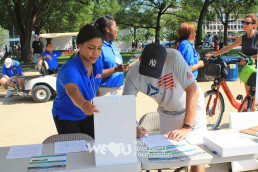 “The WeLoveU has been carrying out initiatives, activities, and events similar to these goals for nearly two decades. And during this time, the WeLoveU has developed an approach to our humanitarian work that is driven by four major core values: humility, encouragement, love, patience, and sacrifice. In short, WeLoveU H.E.L.P.S.,” said John Casas. To wrap up the opening remarks, a special speaker came forward—Mayor Dean Mazzarella from Leominster, Massachusetts. Just an hour outside of Boston, the mayor has been supporting the WeLoveU’s Clean WORLD Movement and spreading the WeLoveU’s message throughout the city of Leominster. “I can’t encourage more to other local elected officials, state or federal officials across the world: this is the organization you want to team up with. The definition of community is WeLoveU Foundation,” he said. 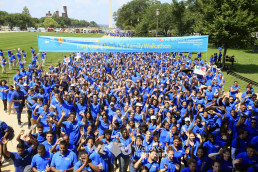 When everyone reached the finish line, a loud “hooray!” resounded throughout the National Mall. It was a meaningful time for all to reflect on the impact of their actions while also realizing once again that all people of the global village are one family. By the early afternoon, families and friends ate their lunches together enjoying the shade and summer breeze. Through the New Life Family Walkathon, the WeLoveU affirms to deliver hope and support to those affected by adversity and misfortune. This can be accomplished with acts of compassion, devotion and an unconditional love of that of a mother. 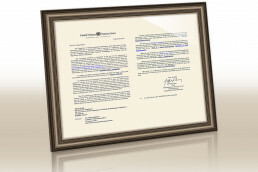 The participant’s steps will reach those in overseas countries and resound throughout the whole world.